Bienvenidos a El Salvador........Welcome to El Salvador! 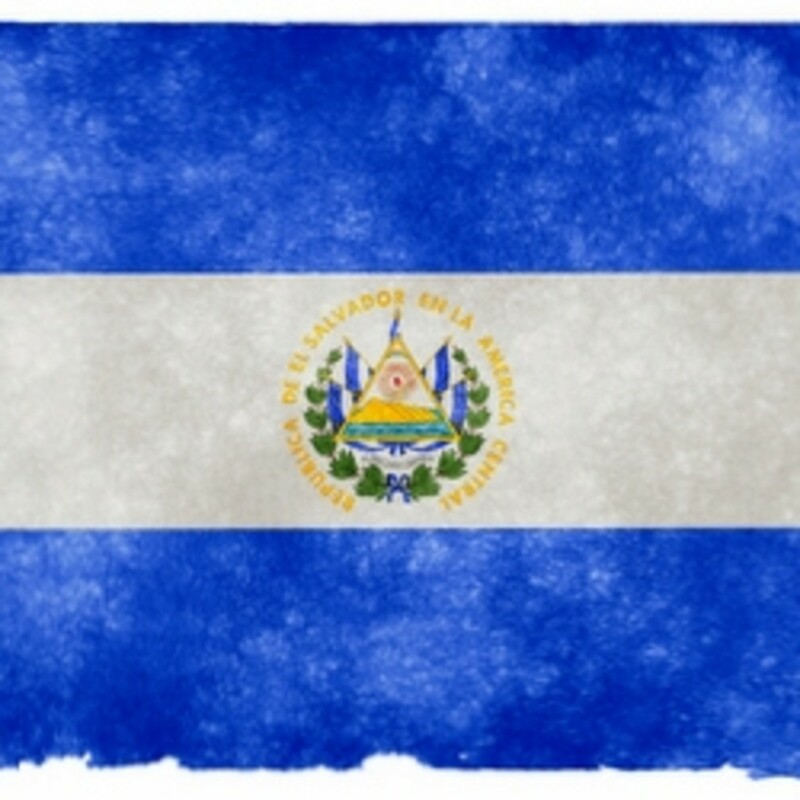 El Salvador is the smallest country, in Central America with a total area of 21,040 sq km (8,124 miles), making it about the size of Massachusetts (20,300 sq km) or Wales ( 20,779 sq km). Mention this tiny country and people will either say "Where is that?" or "Is that where the war is?" Along with almost all of Central America (excluding Belize) it is a former Spanish colony and the national language is Spanish. It is bordered by Guatemala and Honduras and has a population of just over 6 million, of which nearly a third live in the capital, San Salvador. It is also the only Central American country that does not have an Atlantic or Caribbean coastline, which is more than compensated for by the pictureque Pacific Coastline. Despite having a reputation that was founded on its civil war (which ended in 1992) and subsequent gang related problems, the country is a tropical gem just waiting to be discovered. The landscape varies from top class surfing beaches, through Mayan ruins, volcanoes and lakes to San Salvador, capital city and home to museums, art galleries and superb restaurants. In general the Salvadoran people are very genuine and friendly and whilst English is not widely spoken they will always try to make you feel at home. There are many places worthy of a visit , and by limiting this review to ten I have had to be very selective. If you want a holiday with a difference, visit El Salvador...you won't regret it! If you would like to do some background reading on El Salvador then I can personally recommend this history book. Extending from Pre-Columbian times right up until the twenty first century, this book provides an insight into the history, people and modern day problems that have made El Salvador the place it is today. The book explores the colonial period, the problems that occurred after that and explains what caused the civil war in the 1980s. It then moves to on to describe the El Salvador that you will see today, the country and people that intrepid traveller's who venture here come to love. 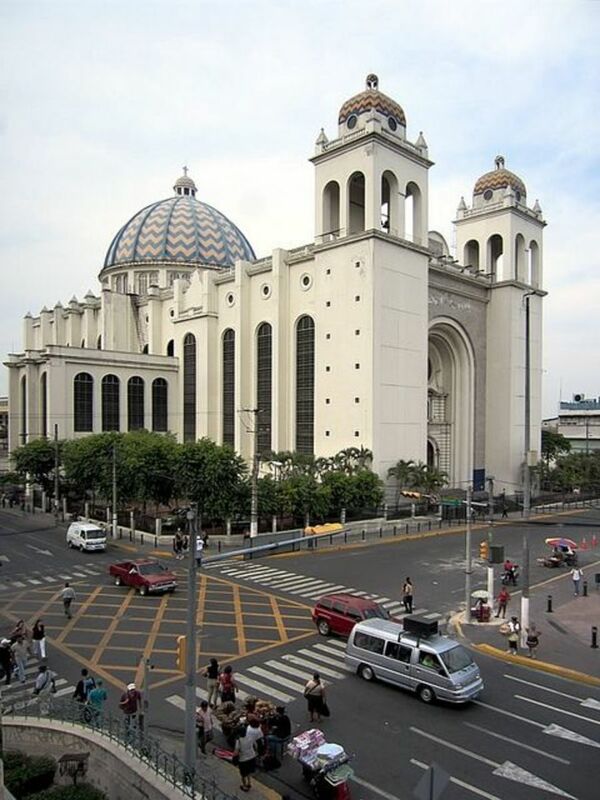 The Metropolitan Cathedral stands in the middle of downtown San Salvador, in an area referred to as "centro". The cathedral stands facing the Civic Square, with the impressive National Palace to its right and the National Theater at its left side. Standing on the site of an earlier church that was damaged by fire, the Metropolitan Cathedral was inaugurated in March 1999, which gave it the honour of being the last cathedral in the twentieth century to be blessed. Until early 2012, the Metropolitan Cathedral of the Holy Saviour had an impressive Fernando Llort tiled facade, which was controversially removed. The facade is now painted in a plain white color. The cathedral, and surrounding colonial area is well worth a visit, and the area has recently been remodelled and as well as improving the looks, public comfort and safety has also been addressed and secuity guards can be seen patrolling the area. Archbishop Romero's funeral was held in the cathedral on the 30th March 1980, with more than 250,000 mourners present. Pope John Paul II visited the cathedral twice, controversially in 1983 and again in 1996, and on both occasions he knelt and prayed in front of Romero's tomb. If you are interested in newly sainted Archbishop Romero you can do a Romero Tour that takes in all of the places in and around San Salvador that played an importat part in his life. The municipality of Suchitoto is located to the northeast of San Salvador, and is 388 meters (1,272 feet) above sea level. It has rural population of approximately 19,000, along with an urban population of about 6,000. Suchitoto still has all the charm of its colonial past, and has been described as having all the charm of Antigua in Guatemala, before the tourists discovered it. Many of the roads still retain their original cobbles, and the colonial church that overlooks the central square is much photographed. Suchitoto is a popular weekend destination for Salvadorans and you will find an increasing number of art galleries and handicraft shops here and there is also a weekend artisan market. It is also a good place to base yourself for a few days whilst exploring the surrounding countryside. There are a few good hotels in the area, but I can personally recommend Los Almendros, an exquisite boutique hotel that is situated a few minutes walk from the main square. Lake Suchitlan, also known as Cerron Grande is worth a visit, and boat trips are available from the Puerto San Juan Tourism Center. There is a pleasant under cover eating area that is served by several small food outlets that serve fresh fish and "typico" Salvadoran food and stalls selling reasonably priced local handicrafts. The center can be accessed by public bus or by foot or car, at a charge of $0.50 per person and $1 per car. The Joya de Ceren settlement was founded before the end of the sixth century, and shortly after, around AD 600 , was destroyed by the eruption of Loma Caldera, which was located within a distance of 1 km from the settlement. 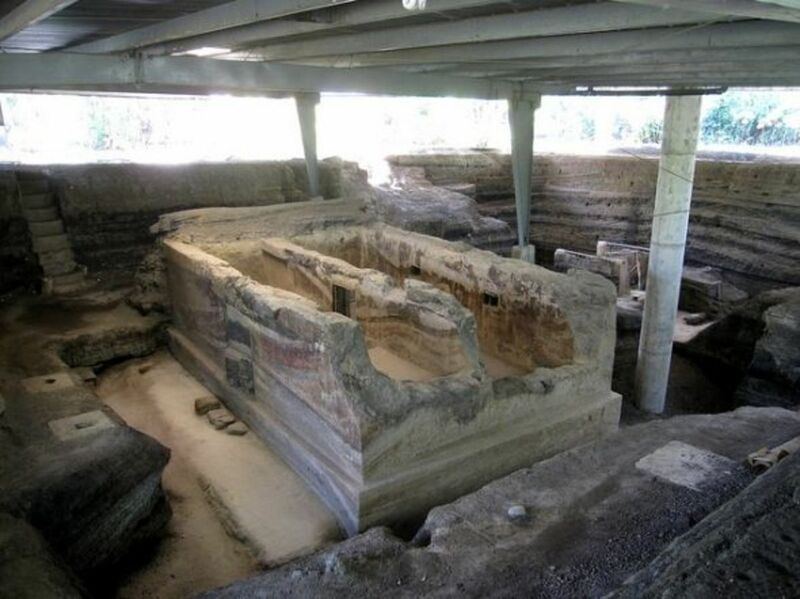 It is called the Pompeii of America, but no human remains were found - possibly because an earthquake caused the settlement to be evacuated before the eruption. Joya de Ceren and the nearby Mayan ruins of San Andres are only a short drive outside of San Salvador and both can easily be visited in a morning. This important historic site is situated on an industrial estate, and it is nowhere near to being fully excavated, but it is still well worth a visit. You will be escorted around Joya de Ceren by a guide, and they will try their best to match you with an English speaking guide if you require one. The Archaeological Park is open on Tuesdays - Sundays between 9am and 5pm and charges $1 for Salvadorans and $3 for foreign visitors. Secure parking costs $1. La Palma is a municipality in the department of Chalatenango in the north of El Salvador, approximately 84 kms (58 miles) from San Salvador, and close to the Honduran border. It sits at an altitude of 1,059 metres (3,474 feet) making the climate more temperate. In the 1970s, Fernando Llort developed the arts in the municipality, encouraging artisans to paint in his style. 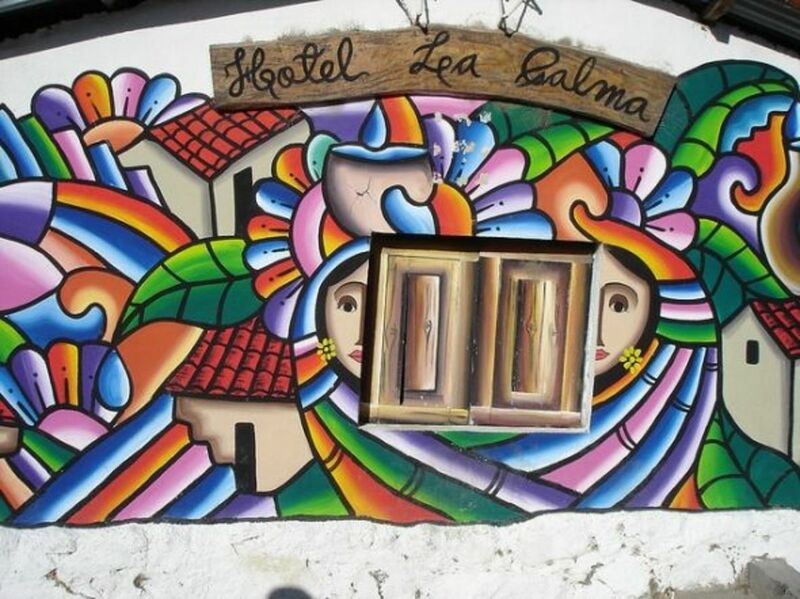 The economy of La Palma is based mainly around the arts and crafts, with three quarters of the population relying on this and the subsequent revenue from tourism. The town is very compact and can easily be explored in a few hours. Whilst you are in the vicinity you might consider a trip to Miramundo. Situated at an altitude of 2400 metres it is famous for its cooler climate, with an average temperature of only 12Â°C (54Â°F). At Easter time, as the dry season draws towards its end and the temperature in El Salvador gets oppressively hot, lake and mountain resorts are a popular way to enjoy a fresher climate. Lake Coatepeque, at 26 km squared, is one of the largest lakes in El Salvador, and was formed during a series of major volcanic eruptions between about 72,000 and 57,000 years ago. At approximately six kilometres (almost four miles) wide and with a depth of one hundred and twenty meters (almost four hundred feet) it is an impressive crater lake. About an hours drive from San Salvador, the lake is a popular weekend retreat for wealthy city dwellers. Indeed, most of the lake front is private property, with impeccably situated houses passed down from generation to generation. Unless you are fortunate enough to know someone with a property here, you may be able to rent a house for your stay. Cerro Verde National Park was created in 2002, and is located at 2030 meters (6,660 feet) above sea level. 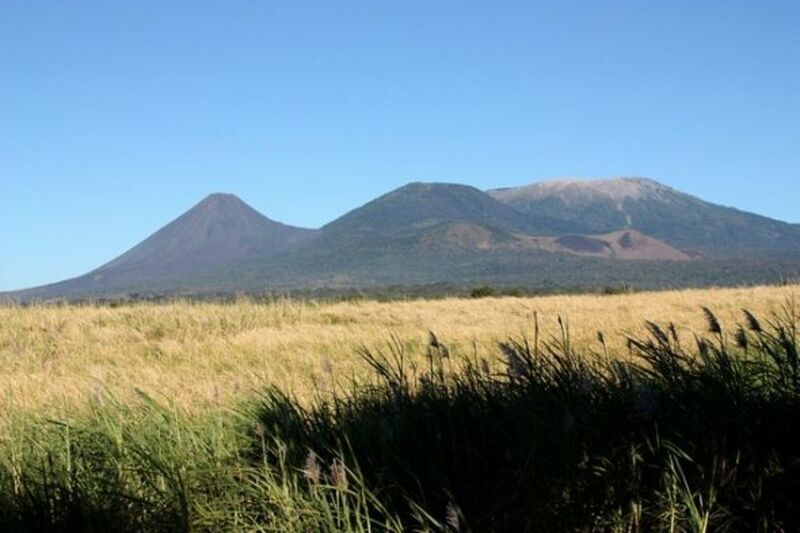 Izalco Volcano and the Santa Ana Volcano are both in the national park. The Santa Ana Volcano is the highest standing volcano in El Salvador, at 2,3647 meters (7,759 feet) and it is recommended that you take an experienced guide with you. The Santa Ana volcano can be climbed in around 2 hours. 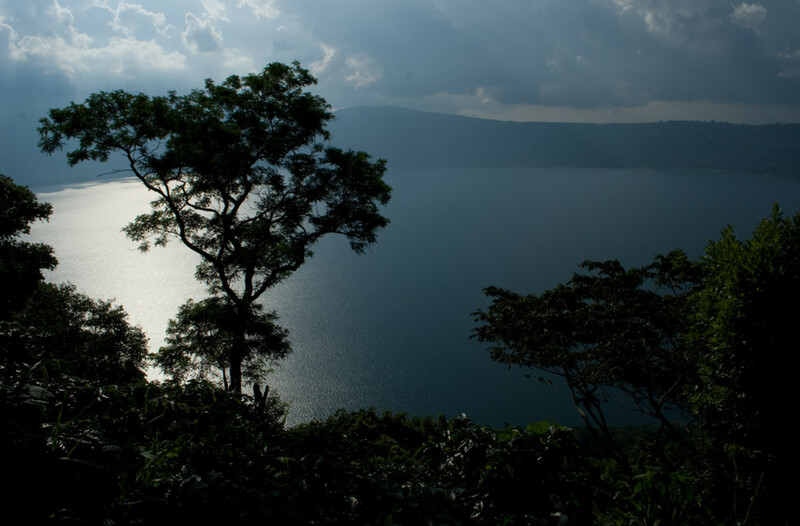 The climb is well worth the sight of the boiling turquoise crater lake and impressive views to lake Coatepeque. Izalco volcano is 1,965 metres (6,446 feet) high and can be climbed in about 3 hours. 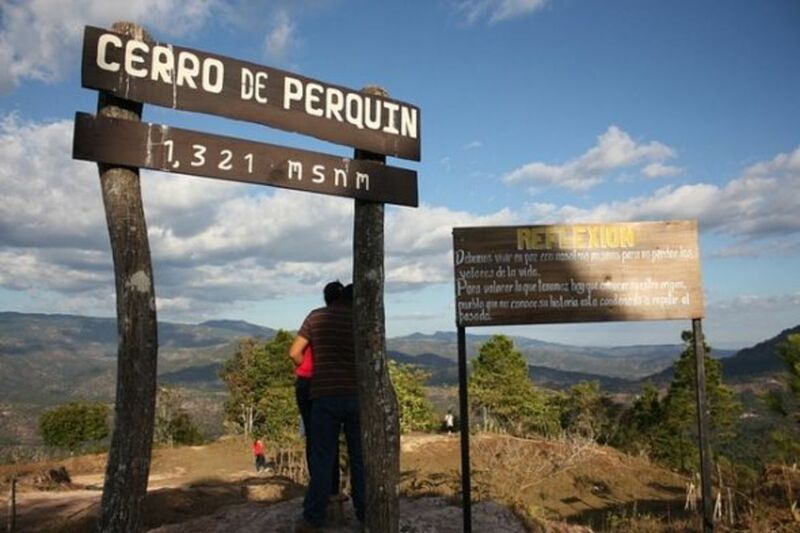 Widely known as the unofficial guerrilla capital during the civil war, Perquin is now a peaceful village in the mountains of Morazan. The main attraction at Perquin is the 'Museo de la revolucion salvadoreÃ±a' (El Salvadoran Revolution Museum), which was officially opened in 1992. The museum contain a large collection of photographs, propaganda, wartime accounts, weapons and radio equipment. As with all Salvadoran museums it is closed on Monday's, but Tuesday to Saturday is open from 10:00 a.m. until 5:00 p.m. Nearby El Mozote is where the infamous massacre of between 200 and 1,000 civilians took place in 1981. The National Park Montecristo is located 125 km North West of San Salvador, adjoining the Honduran and Guatemalan borders. 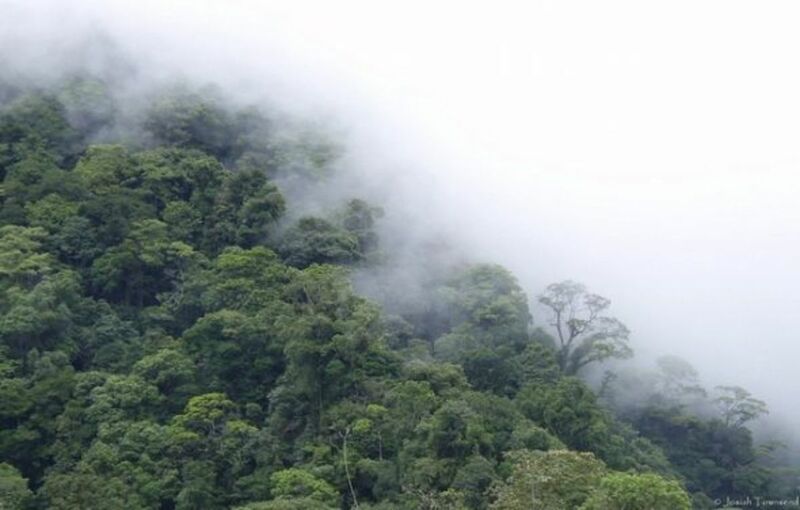 It is sited at an altitude of around 2400m (7900feet) and it was the first protected area in El Salvador. Here you will see many varieties of plants and species of animals that cannot be found anywhere else in El Salvador. El Salvador has a Pacific coastline that contains mile after mile of largely deserted beaches. 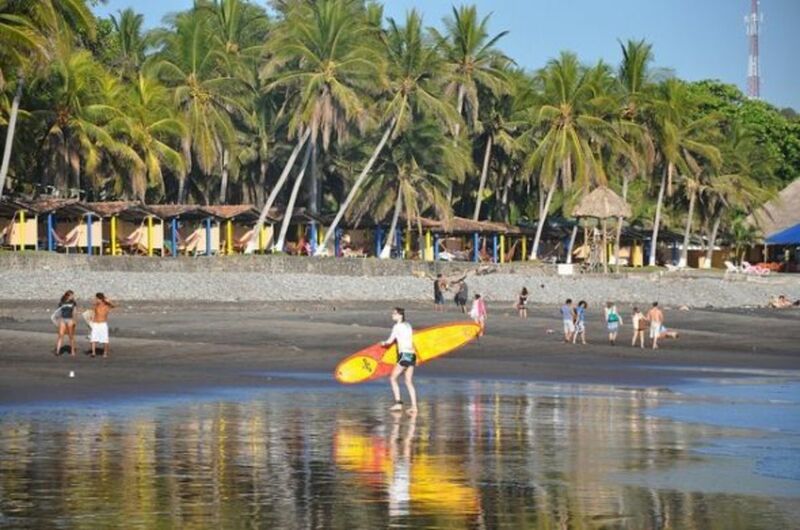 El Sunzal, situated near to the port of la Libertad, is situated on a stretch of coast that is home to world class surfing. Please be warned that the Salvadoran beaches are generally not considered safe for swimming, and I would advise you to exercise caution. The undercurrents are strong and even experienced swimmers can get into difficulty very quickly. Thirty Eight miles (sixty km's) from San Salvador, situated in the mountains, close to to the city of Sonsonate and not far from the Guatemalan border is the town of Juayua. 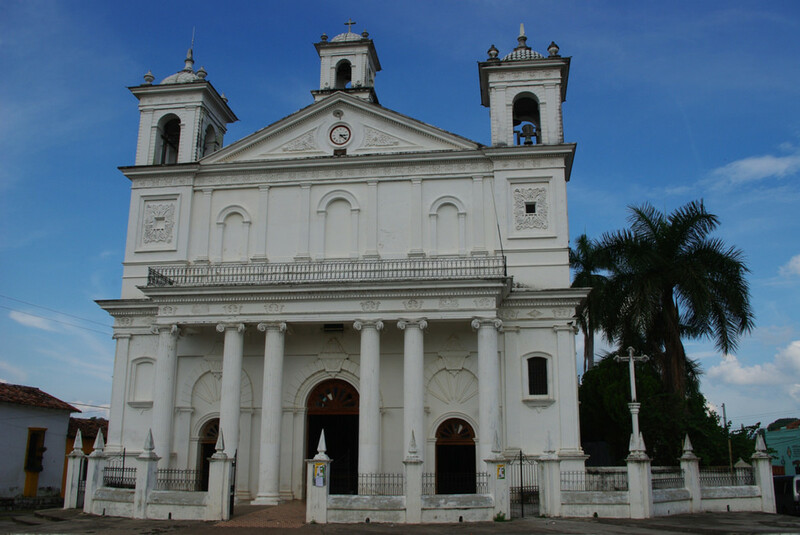 Juayua was founded in 1577, and like many Salvadoran towns and cities it is built around a central square that is also home to cathedral built from white stone. 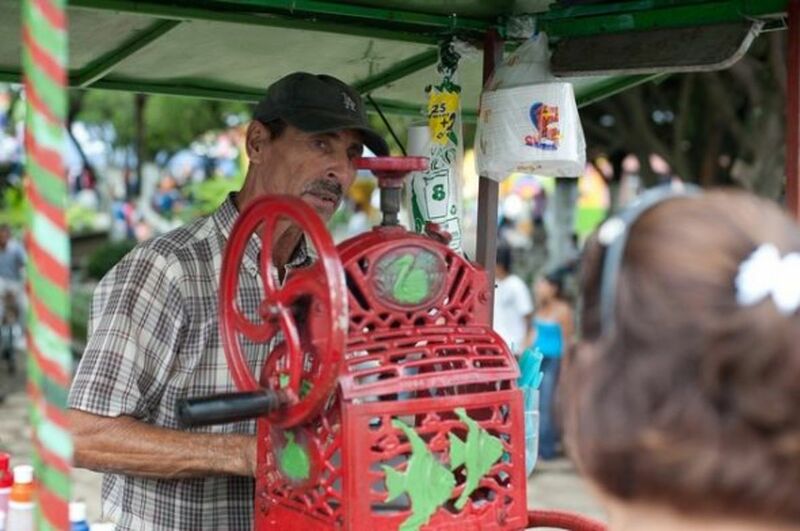 The food festival, held at weekends, is the reason that most people visit Juayua. The surrounding area also has coffee plantations, and a coffee museum is situated here. With its colonial architecture, food festivals and cooler climate, due to the altitude, Juayua is definitely worth a visit. The international airport at Comalapa is situated approximately 50km's (31 miles) from San Salvador, and is served by many international airlines, including the ones shown to the right. Most airlines transit through the USA. If US visas are problematical for you then I recommend Iberia that flies from Madrid, via Guatemala, or KLM that flies from Amsterdam via Panama. El Salvador has a tropical climate with distinct wet and dry seasons. 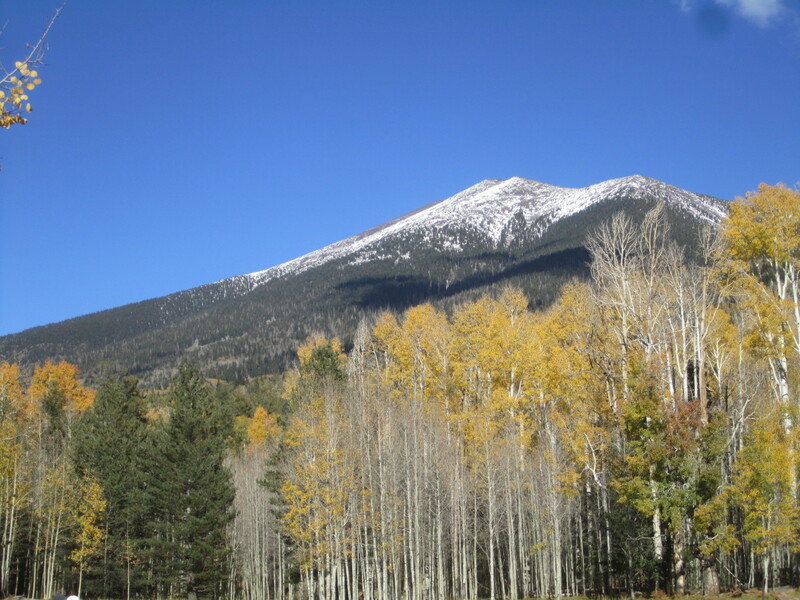 Temperatures vary according to elevation and show little seasonal change. The coastal areas are hot and the central plateau and mountain areas are more moderate. The rainy season lasts from June until November, and although El Salvador is in the northern hemisphere, locals consider this time of year to be "winter". During this time, El Salvador can suffer from flooding and may get the tail end of nearby hurricanes. From December to May, the summer months, the northeast trade winds control the weather patterns. During these months, air flowing from the Caribbean has dissipated most of its water over the mountains in Honduras, and by the time it reaches El Salvador, it is dry, hot, and hazy. Temperatures vary little throughout the year. The biggest variables are caused by altitude. 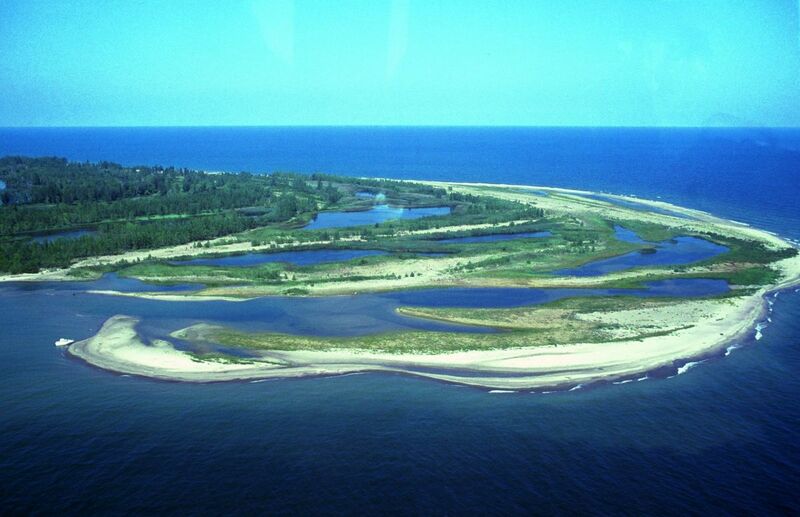 The coastal areas are the hottest with annual averages ranging from 25°C to 29°C. Mountain areas are the coolest, with annual averages from 12°C to 23°C and minimum temperatures sometimes approaching freezing. Have I inspired you to take a trip to El Salvador? Wow! Amazing videos!! Love your lens. I was in El Salvador for a month in the mid-70s. I loved the beach. We stayed on the beach in one of the little huts with bamboo walls and just hammocks for beds. It was great during the week but on the weekend, it was noisy with partying and boozing throughout the night. We were not the partying type. Got quiet again Sunday afternoon. We had a plate of huge fresh shrimps for only $1 back then. Wonder how much it would cost now. I visited El Salvador when we were travelling to Guatemala with my girlfriend. Stayed there just for a day and it's a shame, because this country is clearly worth a full tour. El Salvador must be great! Thank you very much for the great info. All the best and saludos cordiales desde Ecuador. I like all the information you posted in this website! Definitely worth visiting! Great page! I went to El Salvador about three years ago and absolutely loved it. Great article! I would love to visit El Salvador. Nicaragua is the only country in Central America that I have visited. I loved Nicaragua and would love to visit other Central American countries. I enjoyed the video about El Salvador. It looks much more modern and developed than Nicaragua. I enjoyed this lens. Thanks for the virtual tour of El Salvador. I have some friends who have spent a lot of time there and hope I can visit some day. Oh my ... I am feeling inspired for a trip to El Salvador. Actually, I am contemplating a good place to move to ... where I can afford the "rent" and living expenses in my retirement. I would love to go back to El Salvador, I enjoyed my visit but as it was work, I didn't get a lot of opportunity to travel. I enjoyed San Andres, but it doesn't compare to Tikal or Copan, still any Mayan ruins are impressive.